These tubelike structures, formed of an iron ore called hematite, may be microfossils of 3.77-billion-year-old life at ancient hydrothermal vents. Life on Earth may have originated in the sunless depths of the ocean rather than shallow seas. In a new study, scientists studying 3.77-billion-year-old rocks have found tubelike fossils similar to structures found at hydrothermal vents, which host thriving biological communities. That would make them more than 300 million years older than the most ancient signs of life on Earth—fossilized microbial mats called stromatolites that grew in shallow seas. Other scientists are skeptical about the new claims. When life first emerged on Earth has been an enduring and frustrating mystery. The planet is 4.55 billion years old, but thanks to plate tectonics and the constant recycling of Earth’s crust, only a handful of rock outcrops remain that are older than 3 billion years, including 3.7-billion-year-old formations in Greenland’s Isua Greenstone Belt. And these rocks tend to be twisted up and chemically altered by heat and pressure, making it devilishly difficult to detect unequivocal signs of life. Nevertheless, researchers have searched through these most ancient rocks for structural or chemical relics that may have lingered. Last year, for example, scientists reported identifying odd reddish peaks in 3.7-billion-year-old rocks in Greenland that may be the product of stromatolites, though many doubted that interpretation. The best evidence for these fossilized algal mats comes from 3.4-billion-year-old rocks in Australia, generally thought of as the strongest evidence for early life on Earth. But some scientists think ocean life may have begun earlier—and deeper. In the modern ocean, life thrives in and around the vents that form near seafloor spreading ridges or subduction zones—places where Earth’s tectonic plates are pulling apart or grinding together. The vents spew seawater, superheated by magma in the ocean crust and laden with metal minerals such as iron sulfide. As the water cools, the metals settle out, forming towering spires and chimneys. The mysterious ecosystem that inhabits this sunless, harsh environment includes bacteria and giant tube worms that don’t derive energy from photosynthesis. Such hardy communities, scientists have suggested, may not only have thrived on early Earth, but may also be an analog for life on other planets. Now, a team led by geochemist Dominic Papineau of University College London and his Ph.D. student Matthew Dodd says it has found clear evidence of such ancient vent life. The clues come from ancient rocks in northern Quebec in Canada that are at least 3.77 billion years old and may be even older than 4 billion years. Dodd examined hair-thin slices of rock from this formation and found intriguing features: tiny tubes composed of an iron oxide called hematite, as well as filaments of hematite that branch out and sometimes terminate into large knobs. The team also identified carbonate “rosettes,” tiny concentric rings that contain traces of life’s building blocks including carbon, calcium, and phosphorus; and tiny, round granules of graphite, a form of carbon. Such rosettes and granules had been observed previously in rocks of similar age, but whether they are biological in origin is hotly debated. The rosettes can form nonbiologically from a series of chemical reactions, but Papineau says the rosettes in the new study contain a calcium phosphate mineral called apatite, which strongly suggests the presence of microorganisms. The graphite granules may represent part of a complicated chemical chain reaction mediated by the bacteria, he says. Taken together, the structures and their chemistry point to a biological origin near a submarine hydrothermal vent, the team reports online today in Nature. That would make them among the oldest signs of life on Earth—and, depending on the actual age of the rocks, possibly the oldest. That doesn’t necessarily mean that life originated in deep waters rather than in shallow seas, Papineau says. “It’s not necessarily mutually exclusive—if we are ready to accept the fact that life diversified very early.” Both the iron-oxidizing bacteria and the photosynthetic cyanobacteria that build stromatolite mats could have evolved from an earlier ancestor, he says. But researchers like Konhauser remain skeptical of the paper’s conclusion. For example, he says, the observed hematite tubes and filaments are similar to structures associated with iron-oxidizing bacteria, “but of course that does not mean the [3.77-] billion-year-old structures are cells.” Moreover, he notes, if the tubes were formed by iron-oxidizing bacteria, they would need oxygen, in short supply at this early moment in Earth’s history. It implies that photosynthetic bacteria were already around to produce it. But it’s still unclear how oxygen would get down to the depths of early Earth’s ocean. The cyanobacteria that make stromatolites, on the other hand, make oxygen rather than consume it. This summer, a refitted fishing boat is mapping the seafloor around Greenland as the first step in a six-year research program to document the loss of ice from the world’s largest island. NASA’s Oceans Melting Greenland (OMG) field campaign is gathering data that will help scientists both to understand how the oceans are joining with the atmosphere in melting the vast ice sheet and to predict the extent and timing of the resulting sea level rise. “A lot of the major uncertainty in future sea level rise is in the Greenland Ice Sheet,” said OMG principal investigator Josh Willis, a scientist at NASA’s Jet Propulsion Laboratory, Pasadena, California. At about 660,000 square miles (1.7 million square kilometers), the ice sheet is three times the size of Texas. It’s about a mile deep on average and contains enough water to raise global sea levels about 20 feet (6 meters), if it were all to melt. “The question is how fast it’s melting,” Willis said. If the ice sheet were simply melting from the top down, researchers could track its disappearance more easily. However, ocean water melts ice too. The northwest Atlantic Ocean has been warming at an unprecedented rate for the last 10 to 15 years. Where that warm, salty water can reach Greenland’s glaciers, it accelerates their melting. Finding out where that is happening is no easy task. 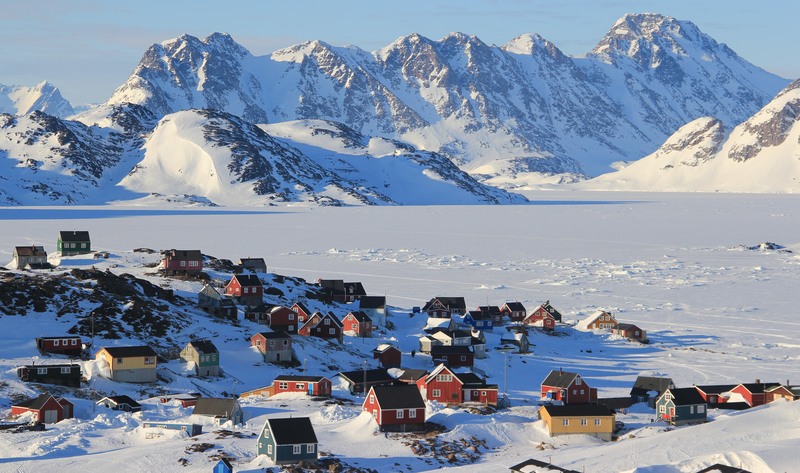 Greenland’s coastline is more than 27,000 miles (44,000 kilometers) long — longer than the distance around Earth at the equator — because of the island’s hundreds of long, narrow fjords, many containing glaciers. Just as the coast is scored by fjords, Greenland’s shallow continental shelf is gouged by underwater canyons cut by the glaciers of the last ice age. In this part of the world, the warmest water is down deep in the ocean, but that water may be able to get into the underwater canyons and reach the glaciers. “We don’t know how deep almost all of the glaciers and the fjords are, nor where the deep canyons cut through the continental shelf,” said OMG co-investigator Ian Fenty of JPL. OMG is making the first high-resolution maps of the complete Greenland coast and continental shelf. The maps are just the opening act of the OMG campaign, however. From next year to 2020, NASA’s G-III research aircraft will take up the job of collecting data. The advantage of aircraft, Willis said, is that “we can encircle the island with observations of both the ocean and the ice. There’s really no other way to do that.” The G-III is based at Armstrong Flight Research Center, Palmdale, California. Starting next spring, the plane will fly NASA’s Glacier and Ice Surface Topography Interferometer (GLISTIN) instrument over the periphery of the island each year. GLISTIN will make very precise measurements of the heights and extents of more than 90 percent of Greenland’s coastal glaciers that reach the ocean, enabling researchers to quantify how much each glacier melted and retreated during the preceding melt season. In the early fall when sea ice is at its minimum, the G-III will circumnavigate Greenland’s continental shelf, releasing about 250 expendable sensors that measure the temperature and salinity of the water up to a depth of about 3,000 feet (1,000 meters) — from the cold, fresh meltwater at the surface down to the warmer, heavier saltwater below. NASA uses the vantage point of space to increase our understanding of our home planet, improve lives and safeguard our future. The agency develops new ways to observe and study Earth’s interconnected natural systems with long-term data records. NASA freely shares this unique knowledge and works with institutions around the world to gain new insights into how our planet is changing. Ship and planes will probe water–ice interface in fjords. When the retired fishing trawler MV Cape Race sets off along Greenland’s west coast this week, it will start hauling in a scientific catch that promises to improve projections of how the ice-covered island will fare in a warming world. 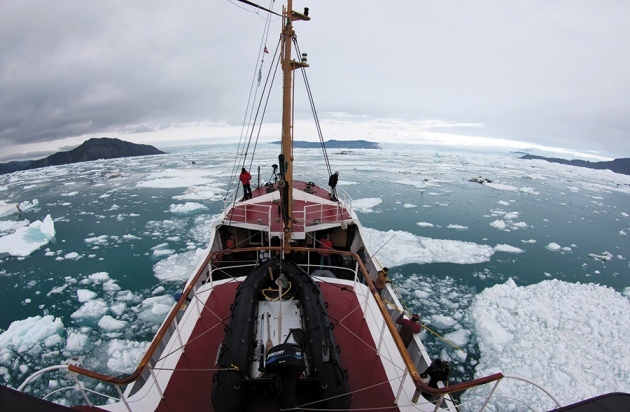 The ship’s cruise is the initial phase of a six-year air and sea campaign to probe interactions between Greenland’s glaciers and the deep, narrow fjords where they come to an end. Called Oceans Melting Greenland (OMG), the US$30-million NASA project will help scientists to predict the future of the Greenland ice sheet, which holds enough water to boost sea levels by around 6 metres and already seems to be melting more rapidly in response to increasing air temperatures. But it is not clear how much the oceans affect the rate of melting along the island’s edges, which depends on poorly known variables such as how warm, saline water interacts with the glaciers. “It should be a powerful constraint on our knowledge and ability to model ice loss there,” says principal investigator Joshua Willis, an oceanographer at NASA’s Jet Propulsion Laboratory in Pasadena, California. When simulating glacier dynamics, current global climate models consider only ice’s interactions with the atmosphere, says William Lipscomb, an ice modeller at Los Alamos National Laboratory in New Mexico. He is working to incorporate ice–ocean inter­actions around Antarctica into a climate model being developed by the US Department of Energy. But in Greenland, the intricately carved coastline makes this much more difficult. The department plans to give researchers at the Naval Postgraduate School in Monterey, California, $466,000 over 2 years to build a detailed model that will link the land ice and oceans around Greenland. OMG data will help to validate that model, says project leader Frank Giraldo. Work by OMG participant Eric Rignot, a glaciologist at the University of California, Irvine, underscores the importance of detailed data (E. Rignot et al. Geophys. Res. Lett. http://doi.org/6dn; 2015). Using sonar data from one part of western Greenland, Rignot’s team found that existing maps underestimate the depth of three fjords by several hundred metres. It also found that glaciers flowing into all three fjords extended deeper than was thought, far enough below fresh surface waters to reach a warm, salty layer flowing up from the Atlantic Ocean that could accelerate melting and contribute more to sea-level rise than had been believed. “With OMG, we are going to reveal the depth of these fjords,” says Rignot. The programme will also provide valuable information on the physical characteristics of glacier ice. Last December, geophysicist Beata Csatho of the University at Buffalo in New York and her colleagues reported using surface-elevation data to estimate how much ice mass Greenland had lost between 1993 and 2012 (B. M. Csatho et al. Proc. Natl Acad. Sci. USA 111, 18478–18483; 2014). The data were fairly reliable over the island’s interior, Csatho says, but measurements were more difficult along its edges, where the ice tends to be warmer, thicker and full of crevices. “It’s still a challenge to get the mass of these glaciers,” she says. When the aerial phase of OMG begins next year, planes will fly inland from the coast, taking measurements of slight changes in gravitational pull that can be used to produce low-resolution maps of the topography under both water and ice. Planes will also drop more than 200 temperature and salinity probes into fjords and coastal waters, and take radar measurements along the coast to track large-scale ice loss over five years. Analysing that ice loss in light of the new topographical and oceanographic data will help researchers to determine where, and to what extent, deeper saltwater currents affect glaciers. Lipscomb says that all these OMG data should help modellers as they incorporate ocean–ice interactions around Greenland into their models. That work is still in its early stages, he says, “but the data that they are getting in this project is exactly what we need”.